By which week of the season do you think we'll hit the point that Plaxico Burress is a footnote in the ongoing crazy road show that is the New York Jets? Burress went to the Jets because they paid him the most money — he needs it — but now that he's here, it's impossible to imagine him anywhere else. Only on the Jets would Plaxico ever have a chance to fade into the background. Plaxico — whom we still believe was named after the evil corporation in a Bond film — had his New Meadowlands debut last night; we wonder what he thought of the new digs, since he was in prison when they opened. 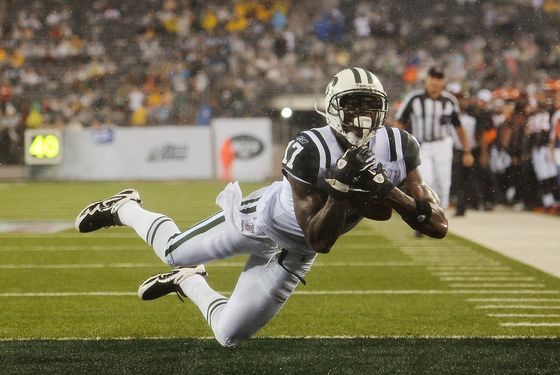 As tends to be the case with Plaxico, he made some headlines: He caught his first Jets touchdown in the Jets' 27–7 preseason win over the Bengals. He was very happy. "I felt like I was moving in slow motion a bit," Burress said of the 26-yard scoring reception that beat a blitz. "I was right there, where I was supposed to be." Burress is 34 years old, so we should probably all settle down: This isn't Randy Moss with the Patriots, or even Plaxico Burress with the Giants. (The Giants are unlikely to "regret" not signing Burress, headlines aside.) But he's an extra weapon for a team that is counting on Sanchez becoming an "elite" quarterback this season. Last night, Burress was the story as he stepped onto the field, and a touchdown just sealed it. He's just one part of the Jets, though, a team with a personality so big it can absorb his story. If Plaxico's first regular season touchdown is less of a big deal, it'll be the best news imaginable for Burress, and business as usual for the Jets.